This piece originally appeared as part of the 20 Great Walks guide in the February 2018 issue of Los Angeles magazine. When people talk about the future of the Los Angeles River, they tend to point to the fairly lush soft-bottomed stretches in Frogtown and Glendale Narrows. But an even more verdant portion threads its way through the Sepulveda Basin in Encino. Start your expedition a half mile south of Victory Boulevard on Balboa Boulevard (there’s parking nearby). Follow a ramp to the dirt path along the tree-lined riverbank. As part of the Sepulveda Basin Wildlife Reserve , this area is a choice landing pad for more than 200 avian species, which chatter among the vegetation. The water’s also deep enough for kayaking (usually allowed from May through September). Walk downstream for about a mile and a half and you’ll find yourself at the Sepulveda Dam, built in 1941 and used as a backdrop for movies like Escape from New York and Iron Man 2. To return, just retrace your steps. Two adjoining greenways in Studio City make for a pleasant 1.6-mile round-trip . 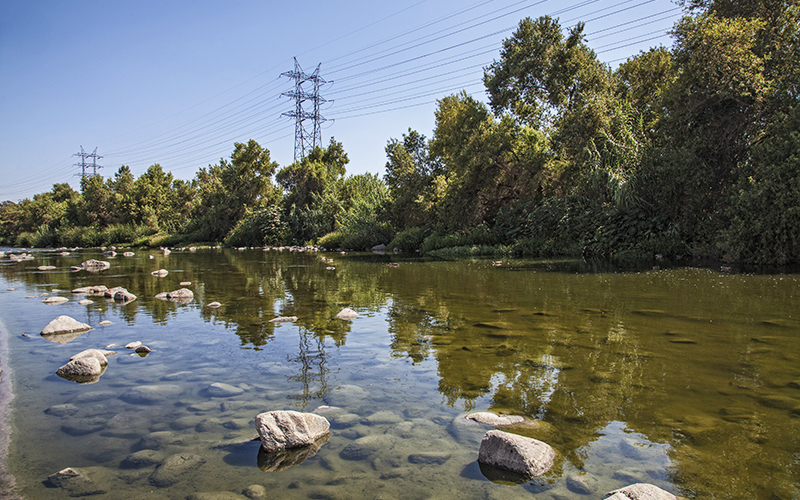 Head onto the river’s south bank at Whitsett Avenue for the native landscaping of Los Angeles River Greenway Park. When you see Laurel Canyon Boulevard, cross over to the Valleyheart Greenway and enter through the giant toad gate. A short stroll that leads past a rattlesnake sculpture on a rock wall and then through a butterfly garden brings you to your turnaround point: CBS Studios, where the river narrows into a less-than-picturesque low-flow channel. The concrete channels here aren’t exactly picturesque, but there’s something to be said for seeing where our namesake waterway begins. A native plant-lined greenway of just over a mile begins at Mason Avenue in Canoga Park and ends at the concrete V where Bell Creek (which descends from the Santa Susana Mountains) and Arroyo Calabasas (which originates in the Santa Monicas) merge to form the Los Angeles River. Frogtown is home to one of the river’s most fertile soft-bottom stretches as well as new green spaces. Park on Ripple Street and enter the Great Heron Gates at Fletcher Drive, heading east on the path to Marsh Park’s serpentine play structure. Spoke Bicycle Café is ahead, if you want to hang out and get a cuppa; farther on is Steelhead Park, which is across from the L.A. River Center and Gardens, making for a 4.6-mile round-trip. Can We Ever Bring Native Fish Back to the L.A. River?